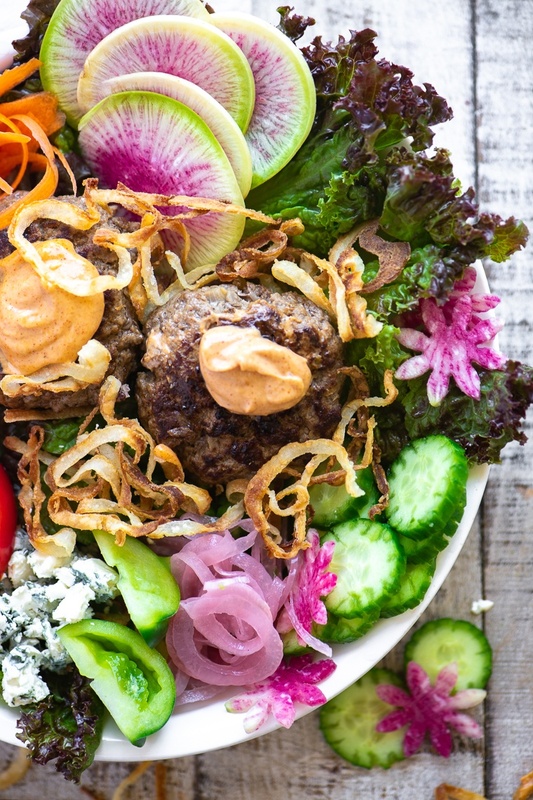 Burger Salad Bowl ~ take everything you love about burgers (except the bun) with everything you love about salad and you’ve got a delicious low carb meal! To make the burgers gently combine the meat with the onions, A1 sauce, and onion salt. Form into 6 small patties, being careful not to over-work the meat. Make little indentations in the middle of each patty, this will help the burgers cook evenly. Cover and refrigerate. Heat about 1/4 inch oil in a skillet over medium high heat for a couple of minutes. Separate the slices of onion into rings, and drop them into the hot oil. They should sizzle on contact, and if they don't, your oil isn't hot enough. Fry the onions, stirring often, for a couple of minutes until golden. Do this in batches so you don't crowd the pan. Add more oil if necessary. Drain the onions on paper towels and lightly salt them. Build your salad bowls by putting the leafy greens in the center of three large individual salad bowls (this will be where your burgers will go.) Surround the lettuce with the carrots, tomatoes, radishes, cucumber, picked onions, and crumbled cheese. Meanwhile wipe out the skillet you used for the onions and add a tsp oil. Heat the pan over medium high and then brown the burgers for a couple of minutes on the first side until nice and browned. Flip, and cook for a minute more, then turn the heat down and cover. Cook for about 5 minutes, or just until they're done to your liking. Place 2 burgers in the center of each of your bowls, top with the secret sauce and fried onions. Serve immediately.